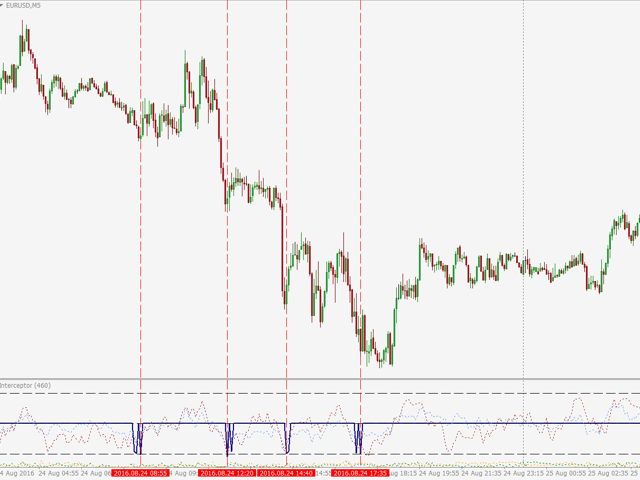 Interceptor - professional volume and price extremes indicator. 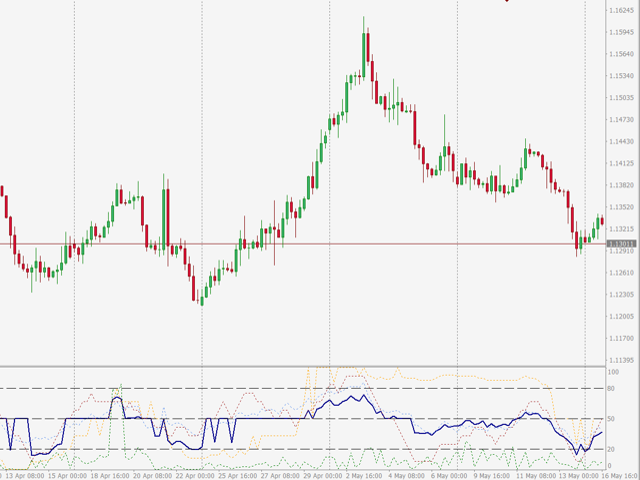 Interceptor is a powerful indicator, which thanks to a combination of four different types of normalized indicators in one algorithm can correctly identify extremes of the price leading to retracements and reversals in the trend. Algorithm is based mainly on combination of Accumulation/Distribution, On Balance Volume, Money Flow Index and Relative Strength Index. 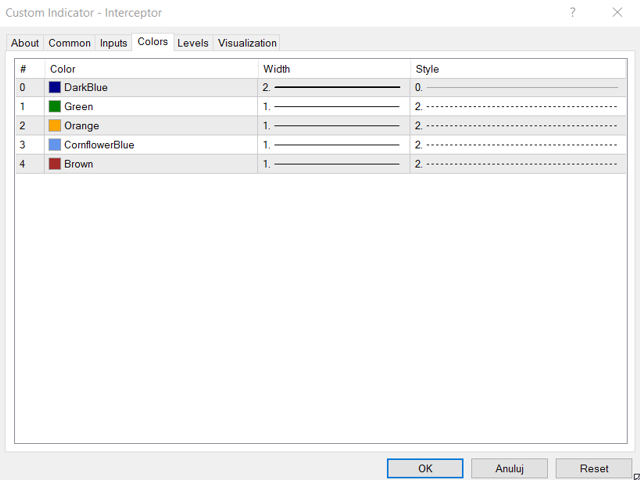 The first parameter of Interceptor is Interceptor_Depth which defines the range of normalization in the number of bars taken for analysis of Accumulation/Distribution and On Balance Volume. 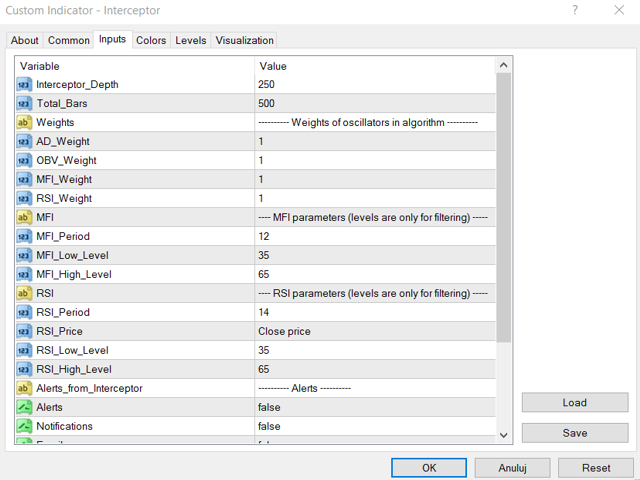 I suggest to try many different values of Interceptor_Depth and I can recommend, among others, to test 75, 150, 250 and 460. Please remember, the lower the parameter (normalization range), the faster the reaction of indicator on the movement of volume and price. The second parameter, Total_Bars, determines number of bars visible in indicator window. Less bars - less resources needed to generate indicator line (faster work, especially with many pairs, for example on VPS - you can see this situation on one of the screenshots below). The next four parameters determine weights of A/D, OBV, MFI and RSI. 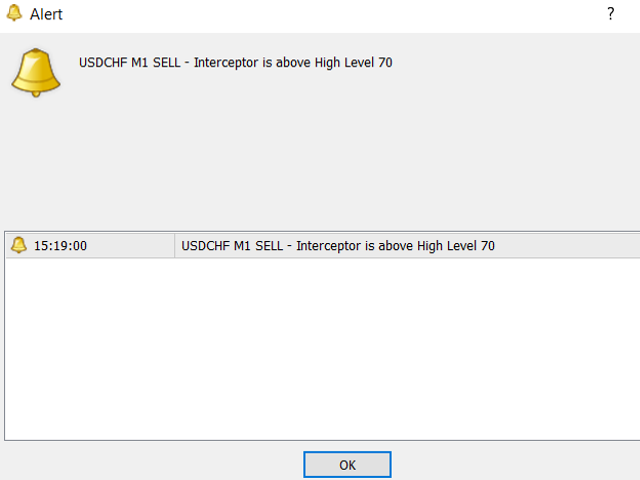 You can precisely adjust the accuracy of Interceptor for each currency pair, equity, commodity etc. and for different timeframes by using the weight of each component of algorithm and adjusting the levels. We can completely disable a specified component of the algorithm by setting the parameter weight to 0. 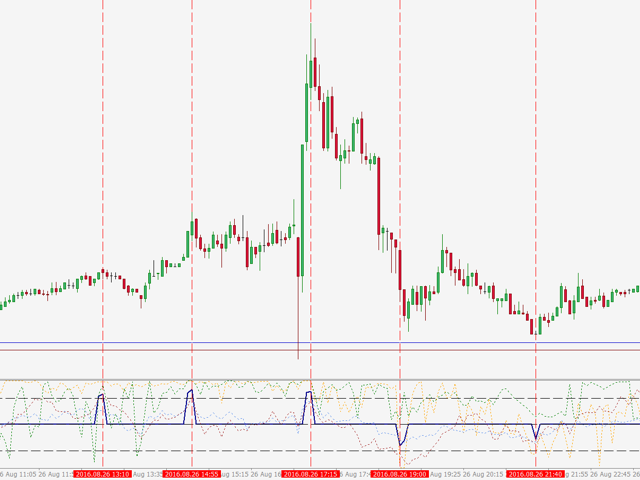 For example, if we want to analyze only changes in volume, we should set RSI_Weight to 0. The next two blocks of parameters contain settings for Money Flow Index and Relative Strength Index. In both cases, only period (MFI_Period and RSI_Period) has an impact on the algorithm of Interceptor. 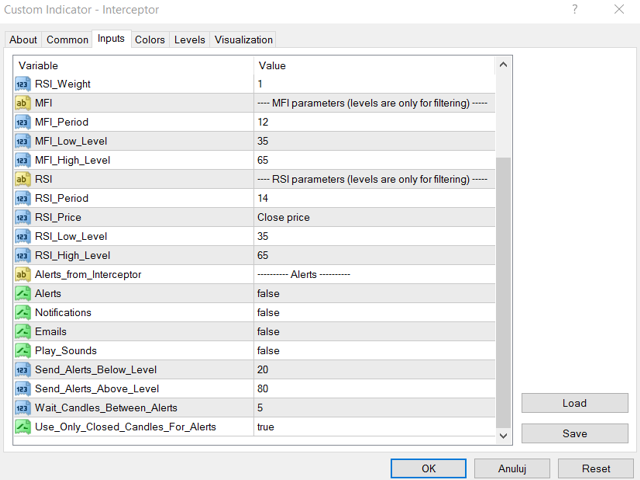 All levels (MFI_Low_Level, MFI_High_Level, RSI_Low_Level and RSI_High_Level) determine the final appearance of the line of Interceptor by filtering out divergent values of RSI and MFI and setting line of Interceptor in the neutral level = 50. 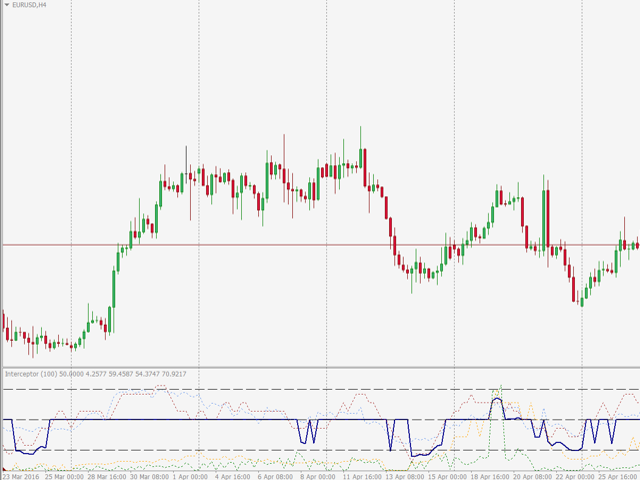 For example, if you set MFI_Low_Level=20, MFI_High_Level=80, RSI_Low_Level=30 and RSI_High_Level=70, line of Interceptor will be above 50 only if the value of MFI will be above 80 and value of RSI will be above 70. Line of Interceptor will be below 50 only if value of MFI will be below 20 and value of RSI will be below 30. To completely disable filtering with levels, you should set MFI_Low_Level to 100, MFI_High_Level to 0, RSI_Low_Level to 100 and RSI_High_Level to 0. But I recommend to use at least levels equal to 30/70 or 40/60 to see only meaningful signals. By the way, for RSI you can also set type of applied price - the default is Close price. The last block with parameters contains settings for alerts. You can use four different types of alerts: alert notifications through the MetaTrader terminal (as you can see on one screenshot with example), push notifications to mobile device (smartphone, tablet), email messages (e.g., from a VPS) and sound alerts in MT4. 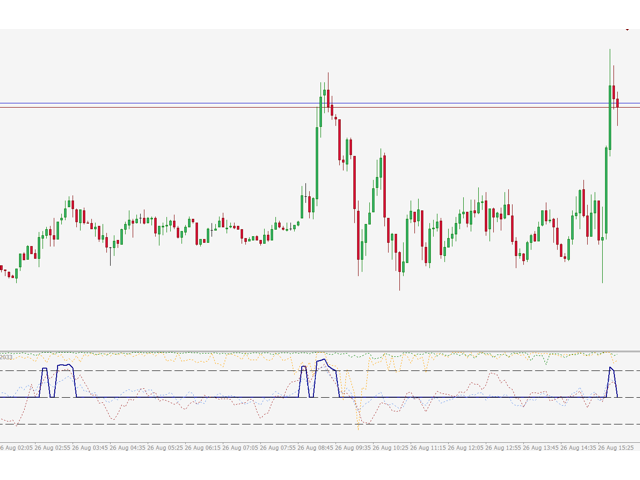 You can set Low and High Level for alerts (Send_Alerts_Below_Level and Send_Alerts_Above_Level) and the period of delay between next alerts (Wait_Candles_Between_Alerts). The last parameter Use_Only_Closed_Candles_For_Alerts determines if you want to receive alerts immediately when the value of Interceptor exceeds Low or High Level (Send_Alerts_Below_Level and Send_Alerts_Above_Level) when set to False or you want to have a confirmation and receive alert only when the value of Interceptor exceeds one of these levels for just closed candle. For default parameters, I suggest you to BUY only if Interceptor line is below 20 or 15 and to SELL only if Interceptor line is above 80 or 85. 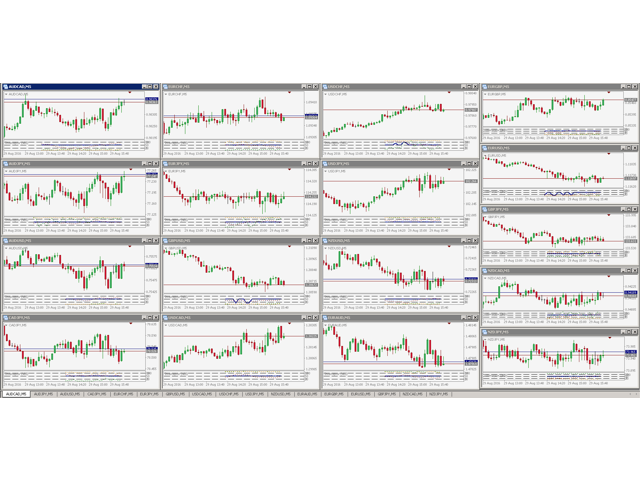 These levels are dependent on the settings of all system components on specified currency pair and timeframe, but I suggest to start changing parameters from the default settings because they are most versatile and suited to all pairs. By default, after attaching the indicator to the chart, you will see in new indicator window one Interceptor solid line (Dark Blue) and four another dotted lines: normalized Accumulation/Distribution line (Green), normalized On Balance Volume line (Orange), Relative Strength Index line (Cornflower Blue) and Money Flow Index line (Brown). All colors are editable. If you want to remove all lines from window except Interceptor line, you should set all colors except Interceptor line (Dark Blue) to None. At the end, I would like to give you one advice. To create a trading strategy based on this indicator, I suggest to wait for confirmation with the next candle after alert. Before you will open a new order, it should occur Engulfing Pattern or Doji (or something similar) and then significantly move in the opposite direction. If you want any further advice in this area, please write to me. Remember, no one except yourself is responsible for any investment decision made by you. Great indicator Dominik, nice work! Keep it up! Highly recommended. 1. Added MFI and RSI to algorithm and levels as filters. 2. Added alerts, notifications, emails and sounds. 3. Added four visible lines of components of the algorithm on the indicator window. 4. Added possibility to adjust weight of each component of the algorithm. 5. Completely rebuilt the entire code.